Trip Log – Day 354 – Dallas TX | How Will We Live Tomorrow? I am a cyclist on a journey to visit the 48 contiguous states. Along the way I ask folks the question, “How will we live tomorrow?” So far, I have travelled over 18,000 miles, visited 45 states, asked thousands of people my question and profiled over 400 individuals and organizations about their view of our future. The adventure has revealed American’s innate generosity and trust. I’ve also visited nine presidential libraries. 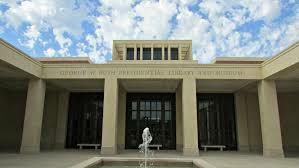 On Monday October 24 I visited library number ten: The George W. Bush Presidential Library. I thought you might be interested in the reception I received. After visiting hundreds of public places and private businesses in my cycling uniform and being greeted with curiosity and good cheer by oil company executives, permaculture farmers, police officers, and homeless individuals, I am appalled by the unprofessional manner in which your staff addressed someone differently dressed. I hope you are as well. The message of compassion expressed throughout the exhibits of the George W. Bush Presidential Library do not ring true after a person is so rudely treated by the museum’s staff. This entry was posted in Bicycle Trip Log and tagged George W. Bush Presidential Library. Bookmark the permalink. Yep – you definitely discovered Dallas. Hopeful Ft. Worth was a more laid back. Your blog from FW was great and duly passed on to others who love that city (and cycling). Looking forward to meeting you as well. Paul, I’m sorry that you had such a negative experience at this Presidential Library. I’d be interested to learn about how you were received at the other Presidential Libraries you had the chance to visit. I, for one, am looking forward with great anticipation to visiting the Obama Presidential Library when it is opened. Presidential Libraries are remarkable accurate reflections of the men they showcase. Security varies greatly – a lot for Ronald Reagan and George W Bush, almost nothing at Jimmy Carter’s. The telling difference is that at every other library, indeed at every other venue I have visited in my yellow lycra, people come up and say , “May I help you?” They do not assume; they allow me to explain myself. That is so different from an opening of ‘Are you delivering pizza?” because if I’m not, the interchange is off to a bad start. Hope everything is going well at Basis Goodyear!